Hilary Arber, Denise Mallon, Jenna Lynch (City of Perth), Gina Pickering (National Trust WA), Pat Forster, Roberta Chantler. The National Trust launched the Australian Heritage Festival; this year’s theme being “Having a Voice” to celebrate the 50th anniversary of the 1967 referendum which gave Aboriginal people a voice in the affairs of our nation. Noongar woman Fanny Balbuk (1840-1907) was suggested to WA Inspired Art Quilters as a possible inspiration and they enjoyed researching historical records to unearth as much as possible about her life and the impact made by increasing white settlement. 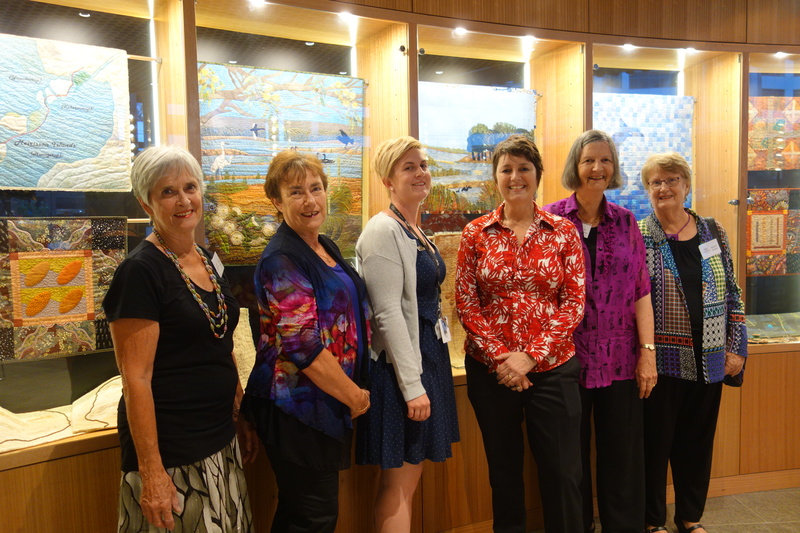 The quilts which have resulted from this research were a focus of the launch in April; they are displayed in the foyer of the City of Perth Library where they certainly created plenty of interest and discussion. This entry was posted in Contemporary Quilt Group, Exhibitions, Notices. Bookmark the permalink. terrific display congratulations, I heard the Embroiderers’ group have their eyes on a few of the exhibits! Whoo hoo!